Basically I had to solder a single wire into the ´Discriminator Output´ of the Radio Receiver = stick wire to small pin of microchip (layman´s terms) This give me a special audio output and using a piece of software called ShipPlotter I can decode the digital AIS signals from ships in our area and plot them on a map. The cool bit is that I can send this data to another server (of my choosing) and thereby do other "stuff" with it... namely something on the TrackNav system! There are huge possibilities here for application to the SMS - including some automatic tracking of SAR vessels and recoding their track during incidents and training runs. I have a lot more playing to do first - and I don´t think too many (if any) if the CCGA vessels actually have AIS transponders yet - but they are not too expensive and I´m going to try and arrange some kind of trial system. 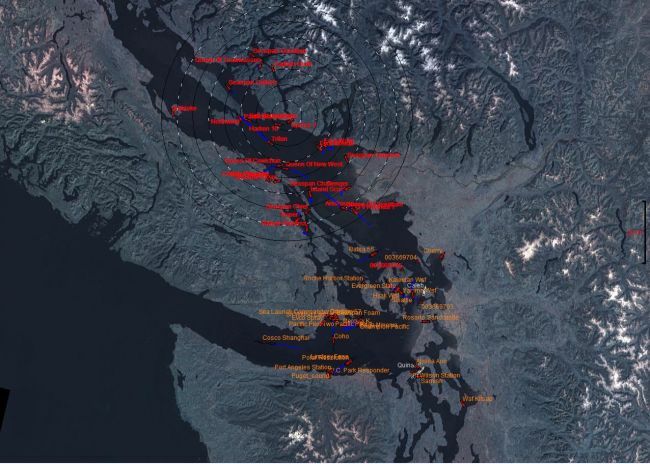 There is potential for using this same system for tracking the SALTS vessels in the summer as well. In other news Wyatt and Kellei are both mending well - Our return home was marked by joint convalescing time for the pair as Wyatt recovers from a pair of herniated disks and Kellei recovers from shoulder surgery (something she has been waiting for since two years ago - a workplace injury) I´m doing my best to keep them both happy and catch up on work - it sounds hectic, but we´re used to that and we´re all still smiling!